The story of the Tarasque is inextricable from that of Saint Martha and the southern French town of Tarascon. It features on the coat of arms of Tarascon, and it is attended to by the Order of the Tarascaires, the Members of the Provencal Order of Knights of the Tarasque. It is part of a long and venerable tradition of French beasts associated with particular cities and usually paraded through the streets during relevant feast days. Etymologies for the Tarasque’s name vary. Folklore attributes the name of Tarascon to the Tarasque, but it is most likely that the dragon was named after the city. Tarascon itself may have been derived from Tauriscus, a Gaulish tyrant supposedly slain by Hercules. As to the origin of the tale itself, everything from vanquished pagan religions to displaced captive crocodiles has been suggested. The earliest elements of what was to become the tradition of Saint Martha in Provence originated in Vézelay in the 11th century. By the end of the 12th century these had been associated with Saint Martha, and developed concurrently with Tarascon. The Vita S. Marthae of the Pseudo-Marcella is the oldest reference to the Tarasque, and is dated somewhere between 1187 (the date of the discovery of Saint Martha’s relics in Tarascon) and 1220. Vincent of Beauvais and Jacobus Voragine based their accounts on the prototype of the Pseudo-Marcella and gradually brought Saint Martha into 13th century martyrologies. The tale served to strengthen the cult of Saint Martha in Provence, and further establish Tarascon’s identity as a cultural, political, and religious center. The Tarasque was found in the woods between Arles and Avignon, near town of Nerluc (“Black Lake”), or otherwise in the Rhone, in a hole by the river. The Pseudo-Marcella gives the most complete description. The Tarasque was a dragon, half animal and half fish, larger than an ox and longer than a horse, with teeth as sharp as swords, and armored on both sides like a turtle. It had the face and head of a lion, a horse’s mane, a back sharp as an axe, spiky scales as sharp as augers, six bear-clawed legs, and a serpent’s tail. It was more than a match for a dozen lions or bears. Having come by sea from Galatia, the Tarasque hid in the river, sinking boats and devouring anyone who came near. In a flourish of erudition, we are told it was the offspring of the sea-serpent Leviathan and the onachus or bonnacon, a creature that fires burning dung as a weapon. The mechanics of such a coupling are left unexplained. The Pseudo-Rabanus adds that the Tarasque, in addition to being an enormous dragon with hooked fangs, had pestilential smoke for breath and sulphurous sparks coming from its eyes. It whistled and roared horribly, and the mere infection of its breath was lethal. It lived along with other serpents. The people of Nerluc entreated Martha to deliver them from this menace, so the saintly woman entered the woods in search of the Tarasque. She found the dragon halfway through eating a man. Far from being intimidated, she sprinkled the Tarasque with holy water and brandished a cross, whereupon the dragon came to her as peacefully as a lamb. Martha leashed it with her belt and delivered it to the people, who avenged themselves by tearing the Tarasque apart with lances and stones. Subsequently Saint Martha preached and converted the townsfolk to Christianity. Some modern retellings claim that the people came to regret the killing of a now-harmless creature, but there is no mention of this in the texts. It was from then on that Nerluc became known as Tarascon, in honor of the dragon defeated by Saint Martha and the power of Christ. However, there is no indication that Tarascon was ever called Nerluc; it is more likely that the story of Saint Martha was attached to a local tradition involving the Tarasque as a symbol of fertility or destructive floods. The description in the Pseudo-Marcellus reads like an overview of the effigy, and the multiple feet brings to mind the feet of people holding and moving the dragon. Lagadigadèu, la Tarasco, Lagadigadèu, la Tarasco de castéu! Leissas la dounc passa, la viéio masco! (“Lagadigadèu, the Tarasque, Lagadigadèu, the Tarasque of the castle! In this case, lagadigadèu is an untranslatable expression, a sort of Tarasconian war-cry, a musical tally-ho. The Tarasca, a dragon effigy paraded in Spanish cities during Corpus Christi celebrations, is a direct descendant of the Tarasque. Dumont, L. (1951) La Tarasque. Gallimard, Paris. Mistral, F.; Berthier, A. trans. (1862) Les Fetes de la Tarasque. M. E. Drujon, Tarascon. Tilbury, G.; Banks, S. E. and Binns, J. W. (eds.) (2002) Otia Imperialia. Clarendon Press, Oxford. Véran, J. (1868) Histoire de la Vie et du Culte de Sainte Marthe. Seguin Ainé, Avignon. Very, F. G. (1962) The Spanish Corpus Christi Procession: A Literary and Folkloric Study. Tipografia Moderna, Valencia. Voragine, J. (2004) La Légende Dorée. Bibliothèque de la Pléiade, Gallimard, Paris. The Velue, the “shaggy one” or “hairy one”, is a dragon from the Huisne River, near La Ferté-Bernard in the Sarthe. It was overlooked by Noah during the Flood but survived anyway, nursing a grudge and devoting its existence to spiteful destruction. The Velue’s egg-shaped body was the size of a large ox and covered with shaggy green fur from which pointed spikes emerged. It had the head of a nightmarish snake and the massive legs of a tortoise. Its snake’s tail could slay man and beast alike with a single swipe. The creature breathed fire and ravaged farms and crops. It gobbled down flocks of sheep and ate shepherds for dessert. It would even be so bold as to enter the streets of the old city – moats and walls were powerless to stop it. When pursued, it would return to the Huisne, displacing enough water to cause it to flood and ruin the surrounding fields. Women and children were the dragon’s favorite food, and it prioritized agnelles or “she-lambs”, the most beautiful and virtuous maidens of the land. This was to be the Velue’s undoing. After it took a young damsel for a meal, it was hunted down by the girl’s fiancé and tracked to its lair in the Huisne under an ivy-covered bridge. He stabbed the dragon’s tail and killed it instantly. Its death was much celebrated. The tale of the Velue is relatively new. Its basis dates from the 15th Century and it was resurrected and expanded in the 19th Century. Much of it is in the tradition of French local dragons such as the Tarasque, but it has not had any major festivals or iconographic conventions. The oldest and only presumed historical depiction of the Velue is a terracotta fountain sculpture dated from the 17th or 18th Century, found in a ditch on the road of La Chapelle-Saint-Rémy. If anything the use of the term agnelles for Fertois women has existed separately from the dragon. In the 16th Century La Ferté-Bernard sided with the Catholic League during the wars of Henri IV. Its governor Dragues de Comnène was a wily commander who claimed descent from the Eastern kings. During a siege led by René de Bouillé, the governor sent a detachment of soldiers out of La Ferté disguised as women. The ruse almost worked; some of the besiegers came gallantly up to the damsels and found themselves under attack, but René de Bouillé’s forces quickly sent the disguised warriors packing. The victory highly amused Henri IV and provided no end of jokes concerning “les agnelles de la Ferté, dont il ne faut que deux pour étrangler le loup” (“the she-lambs of the Ferté, only two of which can throttle a wolf”). The term “peluda” has gained traction as a name solely because it was used by Borges. Some sources even claim it to be an Occitan word – never mind the fact that La Ferté-Bernard is nowhere near the Midi. Borges used the word as a direct Spanish translation of “velue” (much like “hairy beast” or “shaggy beast”) and has absolutely no business being used outside of a Spanish context. Borges, J. L.; trans. di Giovanni, N. T. (2002) The Book of Imaginary Beings. Vintage Classics, Random House, London. Charles, L. (1877) Histoire de La Ferté-Bernard. Robert Charles, Pellechat, Le Mans. Clier-Colombani, F. (1991) La Fée Mélusine au Moyen Age. Le Léopard d’or, Paris. Flohic, J. (2001) Le Patrimoine des Communes de la Sarthe, v. II. Flohic Editions, Paris. Roy, C. and Strand, P. (1952) La France de Profil. Editions Clairefontaine, Lausanne. The Asian eclipse monster has analogues in China, India, Malaysia, Mongolia, Thailand, and the South Sea Islands. In the Philippines, where the legend is widespread, it is usually a dragon or serpent or even an enormous bird. Bakunawa, “Eclipse”, is one of the best-known. The Bakunawa of the Cebuano, or Baconaua as it is known to the Hiligaynon, is a colossal, fishlike dragon as large as the Negros and Cebu islands. It resembles a shark, with gills, a lake-sized mouth, and a striking red tongue. Whiskers one palmo long adorn its mouth. In addition to its powerful ash-gray wings, it has smaller wings along its sides. Long ago there were seven moons in the sky. Bakunawa gobbled them up one by one until it came to the last and largest moon. It failed to swallow it, and tried to bite it into manageable chunks, sinking its teeth deep into the moon’s surface. To this day the bakunawa’s teeth-marks can still be seen on the moon. Every now and then the bakunawa will take to the sky and attempt to finish the job it started by swallowing the moon, causing an eclipse. To make it release the moon, utensils are clanged loudly together to startle it. The bakunawa’s den is in the deepest parts of the sea. In January, February, and March its head faces north and its tail south; in April, May, and June its head faces west and its tail east, in July, August, and September its head points south and its tail north; and in October, November, and December its head is east and its tail west. The positions of the bakunawa during those four phases are used to divine the best time to build houses. A children’s game called Bakunawa for 10 or more players involves one player as Buan, the moon, while another is Bakunawa. The remainder form a circle, holding hands and facing inwards. The moon starts inside the circle and Bakunawa is outside. The goal of the children in the circle is to prevent Bakunawa from entering the circle and capturing the moon – the moon itself cannot leave the circle. Bakunawa can ask individual players “What chain is this?” and they can answer that it is an iron, copper, abaca, or any material they can think of. When Bakunawa captures the moon, the players exchange roles or swap with players in the circle. Jocano, F. L. (1969) The Traditional World of Malitbog. Bookman Printing House, Quezon City. de Lisboa, M. (1865) Vocabulario de la Lengua Bicol. Establecimento Tipografico del Colegio de Santo Tomas, Manila. Ramos, M. D. (1971) Creatures of Philippine Lower Mythology. University of the Philippines Press, Quezon. Ramos, M. D. (1973) Filipino Cultural Patterns and Values. Island Publishers, Quezon City. Ramos, M. D. (1990) Tales of Long Ago in the Philippines. Phoenix Publishing House, Quezon City. Reyes-Tolentino, F. and Ramos, P. (1935) Philippine Folk Dances and Games. Silver, Burdett and Company, New York. Vouivres, the great fiery serpents of France, have been reported primarily from remote, mountainous regions, where they haunt springs, wells, caves, deep ponds, and ruined castles. They are known from Bourgogne, Franche-Comté, Savoie, the Jura mountains, and neighboring areas, with possible relatives in the Aosta Valley and Switzerland. The word “vouivre” is derived from the Latin vipera, or “viper”. Vouivres themselves are the spiritual descendants of Mélusine, stripped of her human features. They have been described as dragons, serpents, and fairies in the form of great reptiles; they are always the guardians of priceless treasures. In its most simple definition, a Vouivre is a female dragon. Vouivres vary wildly in appearance, but are always female and associated with fire and water. The classic vouivre, as observed in Faverges, Fleury-la-Tour, Mont-Beuvray, Rosemont, Solutré, and Thouleurs, is an immense winged serpent covered with fire. Instead of eyes, a vouivre has a single large diamond or ruby in its head that guides it through the air. She removes it when bathing, leaving it blind and vulnerable to theft. Possession of a vouivre’s eye-stone would bring riches and happiness to anyone who stole it. The immense vouivre of Boëge guards treasure and wears a priceless golden necklace. In La Baume she is 4 meters long and covered in gems and pearls. She sometimes leaves gems behind where she lands. The Lucinges vouivre is a glowing red viper that whistles eerily in flight. The Gemeaux vouivre, which appeared between 2 and 3 in the afternoon, was hooded like a cobra. In Brizon, she is equally likely to appear as a bird or a winged beech marten with a brilliant necklace as she is to have the form of a great serpent with wings and a diamond on its tail. Vouivres may not even look like animals. In Chevenoz she appears as a burning fireball streaking across the sky, in Saint-Jean-d’Aulps and Vallorcine she is a single-eyed tongue of fire, and in Le Biot she is a star whose appearance foretells war and strife. The Orgelet Castle vouivre looks like a red-hot iron bar in flight, and the vouivre of Sixt-Fer-À-Cheval is a plumed golden necklace that flies through the air. One of the more effective ways of slaying a vouivre has been making a spiked barrel to hide in. At Condes, a man managed to steal a vouivre’s diamond and hide in a nail-studded washtub; the infuriated, blinded dragon killed herself trying to get to him. While another man at the Aosta Valley slew a vouivre in a similar manner, other prospective thieves have not been so lucky. The vouivre of Reyvroz had a necklace of great value, which was stolen by a man in a spiked barrel; she died and the thief died soon after. The vouivre of Samoëns had her pearl necklace stolen in the same manner, but she constricted the barrel anyway and made the thief return the necklace; she then disappeared and was never seen again. In Manigod, where grass would not grow for a couple of years after the vouivre’s passage, a man who stole her diamond was killed, his barrel smashed, and the gem retrieved. Finally, as with all dragons, vouivres are vulnerable to the power of saints and other holy persons. The vouivre of Saint-Suliac was cast into a deep cave by Saint Suliac after she killed one of his monks. The location became known as the Trou de la Guivre, the Guivre’s Hole. In Thollon-Les-Mémises, among other places, “vouivre” has become a byword for an unpleasant, nasty woman. Modern versions of the vouivre, perhaps conflating her with Mélusine, have embellished with her the features of a seductive woman. Marcel Aymé makes her a wild girl of the forest with an entourage of vipers, and Dubois makes her a beautiful fairy who sheds her dragon skin when bathing. Aymé, M. (1943) La Vouivre. Gallimard. Dontenville, H. (1966) La France Mythologique. Tchou, Paris. Dubois, P.; Sabatier, C.; and Sabatier, R. (1996) La Grande Encyclopédie des Fées. Hoëbeke, Paris. Joisten, C. (2010) Êtres fantastiques de Savoie. Musée Dauphinois, Grenoble. Monnier, D. (1819) Essai sur L’Origine de la Séquanie. Gauthier, Lons-Le-Saunier. Sébillot, P. (1905) Le Folk-Lore de France, Tome Deuxième: La Mer et les Eaux Douces. Librairie Orientale et Américaine, Paris. Long ago, the Yukon and Kuskokwim rivers were far warmer than they are today, and the winters shorter, with the snow melting and the birds returning as early as February. This allowed for large stretches of creeks, lakes, and marshland, and the Păl-raí-yûk haunted the waterways between the two rivers. They were most common around the temperate Kuskokwim, and they fed on humans and animals alike. Păl-raí-yûk was one of Raven’s many creations, one that would lie in wait, submerged, to attack anyone coming to the water’s edge. It would also attack boats that entered its territory. For this reason Raven warned First Man to be cautious about approaching lakes and rivers. The păl-raí-yûk has been compared to the crocodile or alligator, which it resembles in both form and habit, but it is also very similar to the muskox. It is typically represented on umiaks, masks, and dishes as an elongated, stylized reptilian creature with a long, narrow head and six legs. “Cutaway views” above the legs show human remains, indicating the grisly nature of its meals. One păl-raí-yûk that was killed by the Sky People had six legs, the hind ones long, the fore ones short, and the small middle ones hanging from the abdomen. It had small eyes and fine, dense, very dark fur on its body, like that of a shrew, that was longest on its feet. A pair of horns, extending forward, out, and curving back, are present on the head. Păl-raí-yûk are large and bulky, but can lie on grass without bending the stems. On the other hand, a dead păl-raí-yûk would become so heavy that its body would sink into the ground if not supported. Many hunters were usually required to kill one, usually by holding it down with logs while smashing its head with clubs. The last known păl-raí-yûk was slain by a hunter after it killed and ate his wife who was fetching water from a lake. Nelson, E. W. (1900) The Eskimo about Bering Strait. Extract from the Eighteenth Annual Report of the Bureau of American Ethnology, Government Printing Office, Washington. The Codrille, Cocadrille, or Codrille is a variety of basilisk or dragon native to central France, notably Berry, Maine, Poitou, Sologne, and Vendée. It combines features of basilisks and vouivres but without the redeeming aspects of either. The name of the codrille was derived from the same etymological confusion that spawned the “cockatrice”. Starting with Crocodylus, the crocodile, practically a mythical creature in its own right, the name became progressively more garbled, becoming Cocodrillus, Cocodrille, Cocadrille, and Codrille. However, de la Salle derives it from coco and drille, meaning “rooster’s child”. Unlike true basilisks, codrilles can grow to impressive size, becoming leathery-winged dragons at the last stage of their life cycle. The “crown” characteristic of basilisks manifests in the form of a brilliant gem on top of the codrille’s head. Codrilles can kill merely by looking at their victims, and emit an aura of disease and plague. A codrille’s life is a complicated succession of metamorphoses. It hatches from a yolkless egg laid by a rooster, and incubated by the heat of the sun or of manure. To prevent those eggs from hatching, one must plant sprigs of ash in potential codrille breeding grounds. This should be done on the first day of May. Having other roosters around also helps, as they will devour the offspring of a codrille. The codrille starts out its life as a very long, string-like snake. It is capable of killing right out of the egg – anyone who cracks a codrille egg and is seen by the newborn codrille dies instantly, but if they see the snake first, it dies instead. After a while, the juvenile codrille sprouts legs and becomes a salamander. During this stage of its life it will still die if seen first by humans, so it hides in deep wells, ruined tombs, and the masonry of houses, bringing bad luck to everyone living there and whistling ominously at night. It can debilitate a bull merely by crawling under it. At the end of seven years the codrille reaches the adult stages. 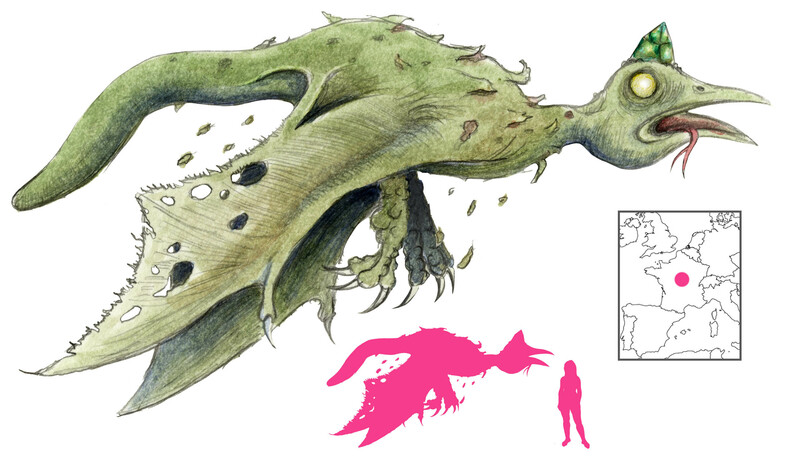 It grows spectacularly, sprouts wings, and metamorphoses into an enormous dragon. It spreads its wings and migrates towards the Tower of Babylon, breathing death and pestilence along its way. Its passage in the air dims the sun, and epidemics and plagues follow in its wake. Sainéan, L. (1921) L’histoire naturelle et les branches connexes dans l’oeuvre de Rabelais. E. Champion, Paris. de la Salle, L. (1875) Croyances et légendes du centre de la France, Tome Premier. Chaix et Cie., Paris. Sébillot, P. (1906) Le Folk-lore de France, Tome Troisième: La Faune et la Flore. Librairie Orientale et Américaine, Paris. Our imagination has always been our greatest ally, and our worst enemy. In the face of the unknown, we populated it with creatures of all shapes and sizes, from minuscule spirits to gigantic cosmic monsters. These entities have shared our world ever since we earned the capacity to wonder. Their stories are told here. Updating with new creatures Monday and Friday! Questions? Comments? Suggestions? Send them to abookofcreatures at gmail, with the dot com. 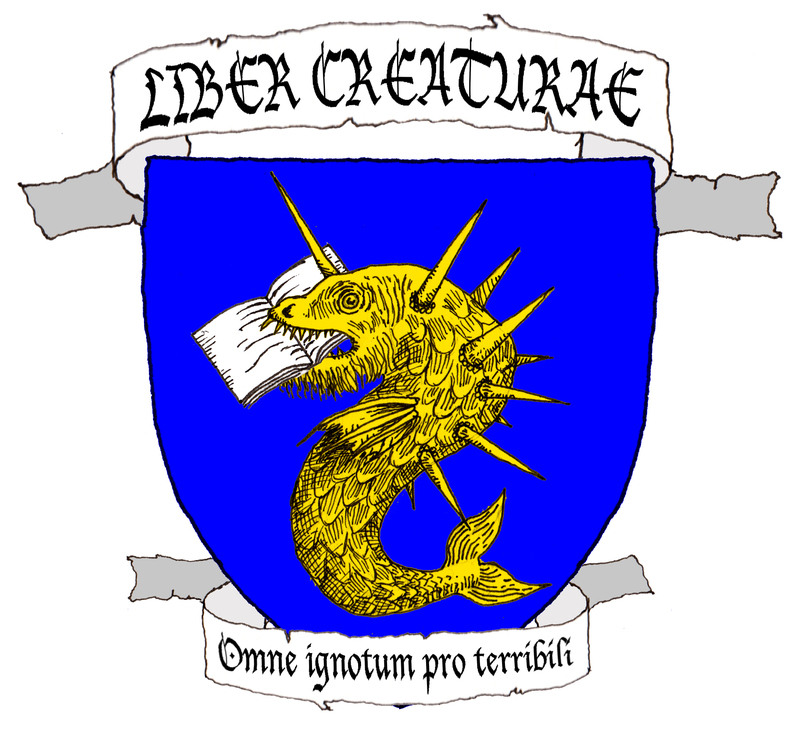 All artwork and text on the official creature entries are © A Book of Creatures. All rights reserved.